Later the method turned out to be working perfectly with plums and strawberries too. Like apricots, plums have high natural pectin content, so they produce a very thick jam. 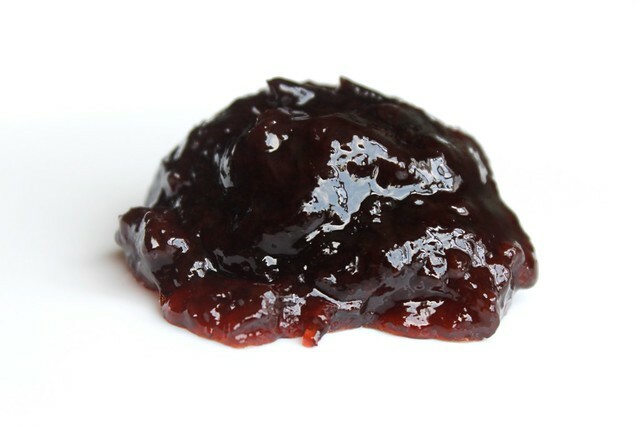 Strawberry doesn't hold like a jelly, but becomes a slightly fluid deep red translucent jam. These are my favorite fruits, but I guess there are more for which this method will work well. This summer I was quite productive and this kind of jam now accounts for more than half of our winter stocks. I guess there is nothing new about this technology, but somehow I just didn't happen to try it before. I learned about it from David Lebovitz and amd extremely grateful to him. After you prepare the fruits the cooking takes around 30 minutes. I do prefer thicker jams overall and I'm always looking for the jam to store safely at room temperature. That's why I keep using 1 kilo of sugar per 1 kilo of fruits. If you have reasons to reduce the sugar content you may well go down to 0.8 or to 0.7 kilo of sugar per 1 kilo of fruit. The jam won't be as thick and may need to be stored in the fridge, but this is a matter of preference. That's how you make it. Place the prepared fruit into a large heavy base pan, which you will use to make the jam. The volume of the pan should be at least 3 liters for each kilo of fruit. Add the water, cover and bring to a boil. Cook on medium heat under lid for around 10 minutes. The fruits should become soft and give out lots of juice. Place a small plate in your freezer (this will be needed to check readiness of the jam later). Take the lid off, add the sugar. Bring back to boil, stirring from time to time to help the sugar dissolve. Cook without lid on medium heat skimming off scum and stirring occasionally to prevent the jam from sticking to the bottom of the pan. It should take around 20 minutes for the jam to get ready. Sometimes it takes 10-20 minutes more if you are cooking large amount (over 2 kilos) at once. When the jam looks thick and slightly jellied, check whether it's ready. Take the plate out of the freezer, pour a teaspoon of jam on it and put it back in the freezer for 1-2 minutes. Take out of the freezer and taste. If it is jellied and has a translucent "skin", it's done. Otherwise cook it a little more and check again. Don't get stressed about this checking. There is not much precision needed here. To prepare the jars, make sure they are clean. Pour boiling water from a kettle over the inside and outside of the jars and lids. Being careful not to burn yourself pour all the water out of the jars and lids and let them stand fro 1-2 minutes. Pour the remaining water out if any. Ladle the hot ready jam into jars, filling them almost to the top (leave around 1 cm empty). Close the jars tightly (while the jam is still hot) and let cool. While they cool down the lids should sag in a little. Closed jars can be stored for months at room temperature. Once open the jar also normally stores at room temperature for some time, but to prevent any risk, store them in the fridge. I'm not much of an enjoying the summer outdoors person so I'm glad I have air conditioning and can stay inside cooking when I have free time. PS: Just realized I wasn't signed in with my LJ id. Oh, I always wanted to make jam in less time than you supposedly need for... this 30-minutes Recipe I will need to try out very soon. Caster sugar? Where can you buy that in Moscow? And what is it called in Russian? Thanks! Can't wait to try this recipe!